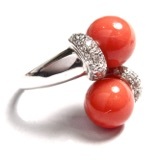 The masterpieces of the traditional manufacturing of coral with 18kt white gold and diamonds. Italian fine jewelry in 18 kt gold and diamonds. The best sculptors and master craftsmen for our coral and cameos. Wide selection of 18 kt gold wedding rings and engagement rings. Sterling silver jewelry, sculptures, frames and more. 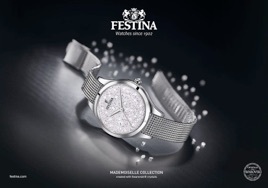 Angelo Fusco’s Jewellery is the official retailer of Festina Watches and Festina Gold. Three generation of master jewellery craftsmen in almost a century of activity. 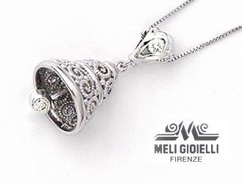 This is the calling card of Meli Gioielli, one of the few jewellery companies that has known how to maintain and hand down over time all of its secrets and the passion for that, which has always been considered an art. Meli Gioielli is recognized as one of the world leaders for its main artisan workmanship Techniques for gold and specializes in the particular goldsmith technique, the Etruscan “madrevitato”: thin gold wires are shaped to create elegant arabesques, embellished in some cases with tiny spheres creating the unique Jewels of the rich cultural tradition of Florence. All FACCO Collection available: Trendy, Essential, Men’s and kid’s collection. 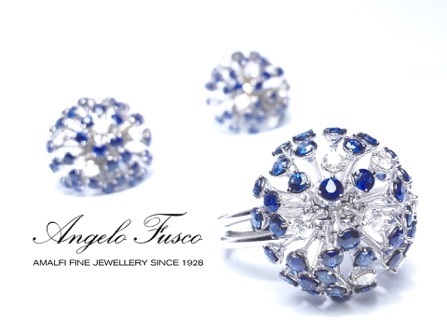 Angelo Fusco Amalfi FACCO Jewels official dealer. Davite & Delucchi’s brand was born thanks to a big passion which unites the two founder members: making unique, refined and essential jewels. Renato Davite with his team, made up of expert goldsmiths, follows in all the steps the handmade jewels realization; Fausto Delucchi, designer, is the creative mind of the company and the chief executive of the commercial and stylistic staff. They create a refined and unique jewel interpretation joined to exclusive design and elegant collections which celebrate the success of the brand. 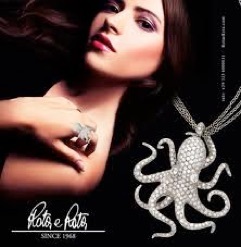 Since 1968 Rota and Rota's creations are the best of Italian jewelry worldwide. 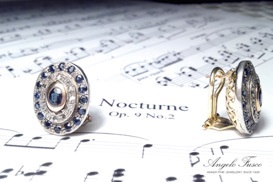 Top quality precious stones and diamonds set on fine gold jewellery. The products are made using only craftmen’s procedures – in complete respect of the centuries old tradition followed by the goldsmiths of Vicenza – with a preference for essentially hand-made creations, to ensure greater attentions to detail an guarantee the exclusiveness of each individual item of jewellery. The idea is fascinating: the use of yellow and white 18 carat gold to enhange the seduction of amethyst, blue topaz, olivine, and highlight the precious nuances of onyx and freshwater pearls. The result is a unique collection, in which pieces evokes ancient yet extremely original atmospheres. Create your own jewel. Strings of multicolor pearls to join together as you like through the special ring-clasp. For the first time women were able to find a collection with such a vast range of colours, shapes and styles, breaking the classical schemes of mainstream goldsmith creations. Synthesising aesthetic cultures of ageless traditions, Ziio Jewels express an ancient soul that reflect the manual ability of skilful craftsmanship and guarantee a timeless elegance that goes beyond all boundaries. 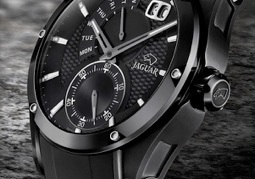 For connoisseurs of Swiss Made timepieces Jaguar presents an exclusive collection of stylish watches manufactured with fine precision and exceptional attention to detail. This new additions to an already successful collection reflect the perfect fusion of technological innovation and elegant design, both characteristics being synonymous with the Jaguar brand. By using traditional craft techniques side by side with the latest technology the company has become one of the most avant-garde companies in the country in the design and styling of its own jewellery. 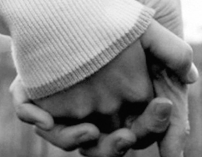 A fashionable brand, to be always close to its customers evolution and originality, to make a simple gesture as wearing a jewel a unique and emotional experience. Angelo Fusco's Jewellery, since 1928, offers a large selection of unique handcrafted jewels of fine italian tradition in gold and diamonds, corals, cameos, pearls. His experience and good taste, his reliability, and his kindness are renowned in Amalfi, and among his customers worldwide. The shop is located at the entrance of Amalfi's main square, a few metres from the shore. 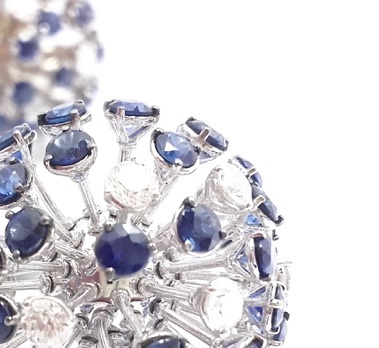 Angelo Fusco selects the most beautiful diamonds and precious stones for his jewelry. Ottaviani experience and proficiency in processing and using the silver as a warm, bright and precious material ensure the perfect execution of designs that express prestige, sophistication and charm. Decorative and functional object for interior, jewelry, bijoux, and in general all the Ottaviani creations are never common, but always inspired by and dedicate to sophisticated atmosphere and desire. The Coral and Cameo WEEK 2018 at the Gioielleria Fusco in Amalfi. The Coral and Cameo WEEK this year will be from May 18th to May 26th. 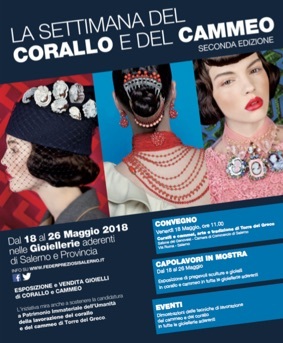 Organized by “Federpreziosi Salerno” and “Assocoral", it is a yearly appointment entirely dedicated to Coral and Cameo jewels. The “Gioielleria Fusco” windows will turn bright red as their own coral creations will be on show, together with other unique jewels from private collections. It’s an itinerant exhibition which promotes the Coral and Cameo manufacturing from Torre del Greco, immaterial World Heritage. Inside the jewelry a workshop will illustrate the technique of coral manufacturing. On Friday, May 18th, in the Hall of the ‘ Genovesi Camera di Commercio’ in Salerno, the first workshop will be held, entrance free. Representatives of the Coral artcraft will participate; videos will be showing how these wonderful jewels are created and a fashion show will see them worn. The project” The Coral and Cameo Week” received the 2017 prize as ‘Best Practice”’ at the Conference of “Sistema Confcommercio” for Italy.